B2B Beat: CMOs Invest in Social But Do They Measure Its Impact? CMOs are investing in digital marketing – especially social media and mobile – at the expense of traditional marketing, according to a recent survey of marketing executives conducted by Duke University’s Fuqua School of Business. And marketers are engaging in this spending on digital -- even if they haven’t quite figured out conclusively how to measure its impact. Duke’s “CMO Survey” found that CMOs plan to boost digital marketing spend by an average of 13.2 percent in 2016. Meanwhile, they plan to reduce spending on traditional media by 3.2 percent. 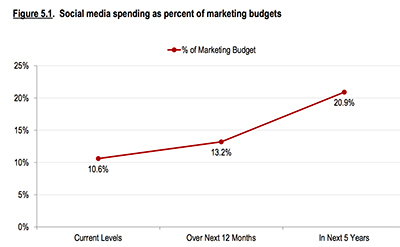 In particular, CMOs are increasing spending on social media, according to the report. Currently, social media accounts for 10.6 percent of the average marketing budget. In the next 12 months, the figure is expected to rise to 13.2 percent. And in five years, social media will account for 20.9 percent of a typical marketer’s budget. That figure is slightly lower for B2B product marketers (17.2 percent in five years’ time) and slightly higher for B2B services marketers (21.7 percent). Marketers gave a collective “meh” when asked if social media was integrated into the overall marketing strategy. On a scale of 1 to 7, with 1 signifying “no integration” and 7 representing “very integrated,” marketers in the survey gave themselves a middling grade of 4.2. Perhaps this lack of integration is why almost half of marketers (47.9 percent) agreed that they haven’t been able to show the impact of social media yet. In B2B product marketing, this inability to show results was particularly striking: 61 percent of these marketers said they couldn’t demonstrate social media’s impact. Meanwhile, just 42.1 percent of B2B services marketers said they couldn’t prove social’s ROI. Stats from the survey show that marketers’ attitudes toward mobile marketing are similar to their attitudes toward social media marketing: CMOs plan to spend more on mobile, even if they can’t justify exactly why. Currently, marketers estimate that mobile comprises 5.9 percent of their budgets. In three years, that figure will surge to 14.6 percent. Even with this predicted rise in spending, 40.2 percent of marketers say that mobile contributes “not at all” to marketing performance. Overall, marketers in the survey reported that they experienced a 2.8 percent gain in marketing return on investment. So why do they seem to be less able to prove ROI when it came to social and mobile? Proving the value of any marketing tactic is an age-old problem. In the survey, 19 percent of marketers said they were unable to show the impact of long-term spending, which is a remarkable admission in this age of data-driven marketing. Perhaps marketers are simply moving so quickly in today’s fast-paced world that they simply haven’t had time to properly measure the impact of social and mobile. Most marketers are probably measuring engagement and traffic metrics on social, but fewer have probably dug in and analyzed their social connections, followers and friends. By analyzing these groups, marketers can ascertain whether their social media connections as a whole are good prospects or good customers and whether social media is turning them into great prospects or great customers. The survey seemed to indicate that marketers, along with increasing their spending on social and mobile, also plan to redouble their efforts to measure the impact of these channels. Marketers said their spending on marketing analytics, which is currently 6.7 percent of their budget, should increase to 11.1 percent three years from now. B2B service marketers will be leading the way: They plan to boost their marketing analytics spending to 12.0 percent of their budgets over the next three years. Origami Logic, a Mountain View, Calif.-based company that markets a marketing measurement platform, has named Steve Wastie as its CMO. Wastie previously held the same title at AppDynamics. 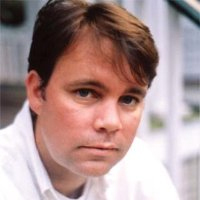 He also worked in executive roles at Xirrus, Juniper Networks, and Inktomi. LinkedIn released The Sophisticated Marketer's Guide to Content Marketing earlier this week. Download this comprehensive guide for insight on how to create brilliant content marketing. Photograph courtesy of Death to the Stock Photo.